So there is obviously somebody out there who doesn’t know how to shave without getting cut. This might also apply to the ladies, many of whom shave their legs, but I don’t hear many complaints from the women in my life, so it’s quite possible that they have figured this out already. If you have problems with bumpy skin, the best solution is probably to either quit shaving, or stick with an electric razor. For the other problems, here are my tips (and some products I use and recommend). I have experimented with saving money by buying dollar-store razors, but since I’m a relatively fast learner, I will never repeat that mistake! I’ve actually done fairly well with name-brand multi-blade (although I have found no advantage in having more than two) razors that are not very expensive (a $2 razor typically lasts me at least 3 weeks), but the one hassle I have with that sort of razor is getting them adequately clean. The real killer of razor blades is not so much the mechanical wear and tear caused by the cutting of the beard hairs, but the corrosion from leaving the blade wet and dirty. A few months ago, I bought a Merkur safety razor (pictured at the top of this article). I chose that particular model because it had good reviews, even though the price was close to what you would pay for a reasonable-quality electric razor. I was initially a little disappointed to find that 1) it wasn’t adjustable, and 2) the handle was a bit shorter than I expected. Turns out that the fixed position of the blade is not an issue, because the engineers at Merkur got it right, and the short handle did not cause me any problems, even though I have very large hands. If you prefer a longer handle, Merkur makes a model with a longer handle. Most folks use a gel or foam applied to wet skin, which is ok, I guess. 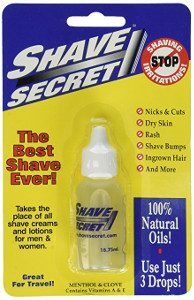 I prefer a product called Shave Secret, which is a blend of aromatic oils. You spread a few drops of Shave Secret with a wet finger on a wet palm, and then rub into your wet skin. The main advantages of Shave Secret over a foam or gel are 1) you can see better where you are shaving, 2) you don’t have to wash it off (it’s a bit like built-in after shave), 3) the tiny bottle is easy to travel with, and 4) it doesn’t contain soap or detergent, which means that your blades last longer. A bottle of the stuff lasts me a little over 2 months, so the 5-pack for $22 is about a year’s worth. Going too fast with a sharp edge is a recipe for getting cut. Plus, light strokes actually work better than trying to scrub that stubble. So, don’t press down on the skin — use several light strokes to get a really close shave. 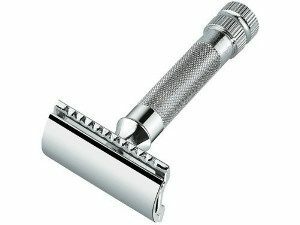 A big advantage of the safety razor is that you can remove the blade for thorough cleaning and drying, which prevents corrosion from dulling the edge. I use a Kleenex (other brands of tissue would work, but I like Kleenex because they seem to have a better QA department, and Kleenex doesn’t come with defects that interfere with other uses of facial tissue) to wipe and dry the blade and my razor before putting it away. A few (careful!!) wipes of the blade works to hone the edge, which also makes it last a bit longer. I always flip the blade over when I re-install it so that the next time, I use the opposite side of the blade — although I don’t really know for sure whether that actually helps anything. I haven’t had a nick or razor-burn in several years using these techniques. 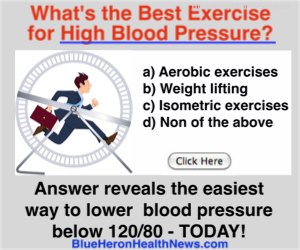 This entry was posted in Frugality, Health. Bookmark the permalink.